It’s good to see that Tim Burton is stretching himself these days. 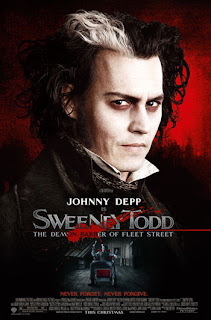 While his past films have focused on alienated loners with dark pasts, Sweeney Todd: The Demon Barber of Fleet Street is the story of… an alienated loner with a dark past…Oh man, I’m not doing this well at all. Okay, well you know how Johnny Depp usually plays alienated loners with dark pasts, in this film he plays murderous 19th century barber Sweeney Todd who is…damn…an alienated loner with a dark past. But he sings this time, so that’s something right? Edward Scissorhands didn’t have singing, did it? Of course, I’m joking. It is Christmas Eve after all, and what better way to kick off the festivities than to review Tim Burton’s new song-filled splatterfest? Based on the Stephen Sondheim Broadway musical, Sweeney Todd tells the story of Benjamin Barker, a London barber who is wrongfully imprisoned for 15 years. Upon his release, he learns that his wife was raped and murdered by the slimy Judge Turpin (Alan Rickman), who has adopted his daughter Johanna (Jayne Wisener). Under his new moniker Sweeney Todd, he opens a barber shop above a failing pie shop run by Mrs. Lovett (Helena Bonham Carter) and plots revenge against Turpin. Reunited with his razors, Todd becomes bloodthirsty, and when he can’t lure the judge into his shop for a shave and a sliced throat, he decides to off just about everyone else in London right in his barber’s chair. They’re all terrible people, after all. Of course, this begs the question: what do you do with the bodies? After slicing the throat of Signor Adolfo Pirelli (played brilliantly by Borat’s Sacha Baron Cohen), he and Mrs. Lovett decide to grind him up and bake him into meat pies. Their joint death and cannibalism venture soars: London lines up for a taste of Mrs. Lovett’s delicious meat pies (humans apparently taste a lot better than alley cats), while Todd gives his customers the closest shaves of their lives before dumping their lifeless bodies into the basement. In other words, Sweeney Todd provides fun holiday hijinx for the whole family. Having never seen the show, I was impressed by the singing abilities of Depp and Carter. Heck, even Alan Rickman surprised me. While the commercials have downplayed the fact that this is indeed a musical, the uninitiated may find themselves loving it just the same. With Burton behind the camera, Stephen Sondheim’s macabre tunes find new life. It’s no wonder Burton was drawn to this play when he saw it for the first time in college. Is it gory? Absolutely. I tend to think that I’ve seen it all as far as on-screen bloodletting goes, but Sweeney Todd really lets the red stuff fly. It spurts, it sprays and even cascades from London’s better throats, and often becomes a character in and of itself. Sweeney Todd is one of Tim Burton’s most daring forays in film, and I doubt any other director could have pulled off this adaptation as skillfully. This is easily Burton’s best film in years.